But I'm back from a trip to Chicago for Perfectly Posh, a primary election (loonngg day of work), and a trip to New Jersey for a wonderful visit with my best friend. And before I even left on all this, I finished my eighth book this year. It satisfied the 11th category on the PopSugar Reading Challenge - it's a book that's becoming a movie this year. While I hadn't even heard of it before, I'm excited to see it now. 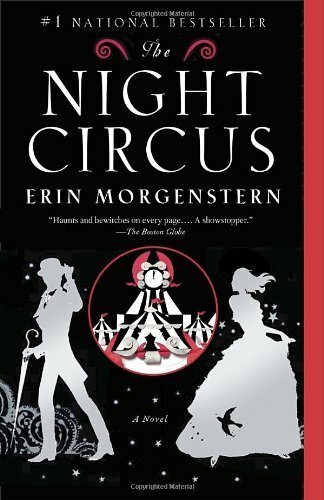 The Night Circus by Erin Morgenstern is a fabulous fantasy about real magic, although most of the characters prefer other words, like enchantment. The premise is indeed fascinating, where two old illusionists pit their protege against each other, in a battle that potentially lasts forever. They create not only their skill-sets, but also the arena for the competition, with little concern of innocent bystanders involved. I'd definitely recommend this book, if you're all right with things not being easily proven and believable in your 'real' life. I can't wait to see the fabulousness on the big screen. Good for you for reading your 8th book this year! I love reading as well. This book sounds interesting. Thanks for sharing and I'll watch out for it on the big screen. Sounds like a good one to see at the movies! I'm not a big reader, but hate to admit that. I remember hearing about this book before. I totally forgot I wanted to read it. Thanks for the reminder. This is surely a cool read! Reminds me of Now You See Me movie. Thanks for sharing.